On our first morning in San Simeon, the California city located halfway between San Francisco and Los Angeles, the skies were clear and the air crisp and cool. It was a perfect day to walk along the shore, watch the lazing sea lions near the Piedras Blancas Lighthouse or out-smart zesty squirrels searching for crumbs. San Simeon and its neighbor Cambria are historically quaint sea-side towns attracting tourists for their natural ambience, the Hearst Castle, art galleries and shops. 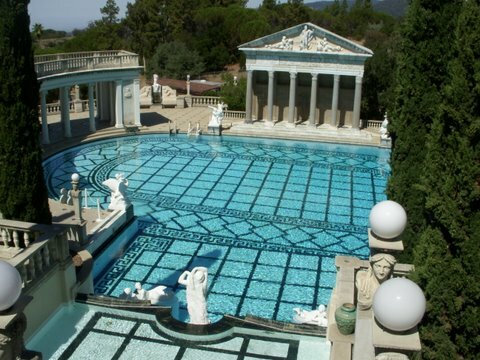 For me the attraction was the Hearst Castle as I had seen and reviewed Orson Wells’ film Citizen Kane’ at a summer course I took at Stanford University in 1975. The movie is supposedly a fictionalized version of the life and times of William Randolph Hearst with the Hearst castle presented as Kane’s castle ‘Xanadu’, a gloomy and self-indulgent folly. At time of release, Hearst had sought to ban the movie but somehow was not successful. The accompanying hoopla generated more fame for the movie than it merited. Now after all these years I would finally be seeing the original castle. The view of the Pacific and the winding drive past farms and meadows builds up the mystique of the Castle perched sixteen thousand feet atop a hill of the Santa Lucia Range. The Visitor Center is at the foot of Castle and houses the W.R. Hearst exhibit, food services, Hearst memorabilia, museum gift shop and the National Geographic Hearst Castle Theater. We had booked the Castle tour, recommended for first time visitors in advance. We heard that the evening tour, when the castle is lit up and live actors impersonate the main protagonists, is interesting. During the 5-mile climb from the Visitor Center we were given a verbal history of the Castle highlighting the surroundings that once housed the world’s largest private zoo. A crusty ‘old’ guide welcomed us at the Castle and in her introduction made it clear that she would not be answering any political or scandalous details about the family. The opulence and grandeur of the palatial exterior was highly visible as we followed our tour guide up the steps towards Casa Grande, the main house, and along the Neptune Pool with façade imported from Rome. The pool said to be remodeled thrice to satisfy Hearst’s whims. This was but one part of the fifty-six bedroom, sixty-one bathroom and nineteen-sitting room house. Casa Grande surrounded by one hundred and twenty-seven acres of gardens, indoor and outdoor swimming pools, a movie theater, tennis courts, an airfield and a gravity-based water delivery system from a nearby mountain. I think most of us made mental calculations and the labor and money costs in the transportation of men and material up the hills at a time when there were no paved roads. Young Hearst would accompany his parents to this camping site property. By the time he inherited the property from his mother, Hearst was in his fifties and tired of living in tents. He hired architect Julia Morgan to design a residence that would be a fitting tribute to his art and antique collections. In 1957 the Hearst Corporation donated the property to the state of California and in May 1976 the Castle became a United States National Historic Landmark. In June 1972 it joined the National Register of Historic Places. It was an awestruck group that walked along the Esplanade and the gardens replete with marble sculptures. In the eighteen room guesthouse the Casa Del Sol, we were shown four bedrooms, four bathrooms and sitting area and then taken to the ground floor of the main house, the Casa Grande. It was hot and humid and the flowers too appeared listless. The grandeur of Spanish antiques, Flemish tapestries of the ‘Morning Room’ and the elaborate concentration on building details compensated for the energy sapping day. Our tour took in five rooms on the ground floor of the main house and the Assembly Room where William Randolph Hearst entertained his guests, the Refectory or the dining room, the Billiard Room with 1920’s billiard table and the private home theater still much in its original state. From here, we were marched to the Roman or indoor pool with blue and gold tiles, an architectural wonder straight out of an ‘epic’ film set. 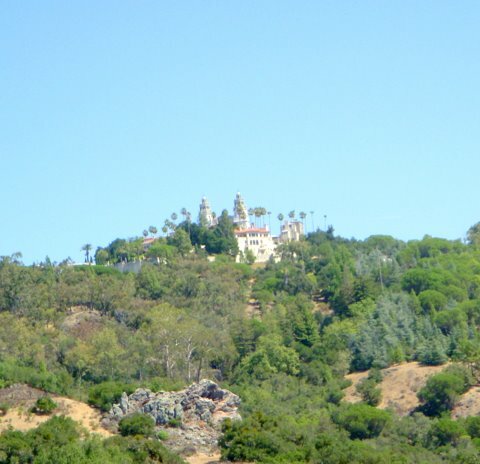 The entire Castle is a pastiche of western and eastern architecture and truly is the ‘Enchanted Hill’, an appellation used by William Randolph Hearst. The present Hearst family resides in a Victorian Mansion hidden from pubic eye by eucalyptus grove. Once the tour was over, we returned to the Visitor Center to watch a documentary about the genesis of Hearst castle that started as a modest dwelling, a place where William Randolph Hearst could relax with friends, but soon expanded to grand proportions. The documentary opened with a shot of a boy infatuated with mist-covered hills along the Pacific coast and explained how he set about building a castle to incorporate the ideas absorbed during his Europe tour with his mother. The castle was clearly a dreamer’s residence with timeless tapestries, rare books, strategically placed church benches along the dining area walls, intricately executed wood work ceilings and the world’s largest private zoo. The documentary ended with words that William Randolph Hearst followed his dream. This prompted a person sitting behind me to say ‘He had the money’. Moving through the Castle one can imagine the financial thoughts flitting through visitor’s minds especially during present period of recession. On occasions, the castle comes across as a pasting together of different architectural and art forms through the medium of money with the view of the Pacific coastline its redeeming feature. In its heyday, the castle boasted an impressive guest list that included stars and political stalwarts such as Charlie Chaplin, Cary Grant, Charles Lindbergh, the Marx brothers, Joan Crawford, Clark Gable, Bob Hope, James Stewart, Calvin Coolidge, Franklin Roosevelt and Winston Churchill. It must have been exciting to meet with well-known personalities. Towards end of tour I could not resist asking the our guide about ‘Citizen Kane’ and whether it was filmed here. She turned out to be a die-hard Hearst fan or a faithful employee because with a brusque reply denounced the film as piece of fiction. In a way she was right as ‘Xanadu’ was a Florida castle and Orson Wells was no William Randolph Hearst.